We recently visited Bottaia Winery and had an exceptional experience. 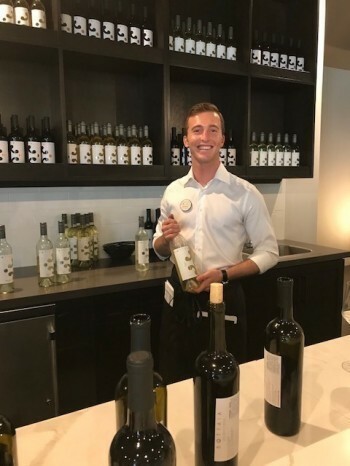 Our server, Zachary, was friendly, attentive, and very knowledgeable about the various wines and flavor nuances, making for a highly enjoyable tasting experience. My husband especially enjoyed the 2013 Montepulciano Reserve, which was delicious—silky, complex, fruit-forward and rich. My favorite wine was the 2016 Arneis, which was elegant, with subtle fruit, balanced and smooth, perfect for a warm late-summer afternoon. The tasting options include a casual tasting in the Barrel Room ($25), consisting of three whites, three reds, and a barrel tasting. The winery also offers a seated, guided experience of wine and food pairing, featuring high-end charcuterie ($50-55). Coming soon will be their Wine Blending Lab. This experience will allow you to blend and bottle your own wine to take home—like being a Winemaker for the day ($80-100). The property also boasts a beautifully appointed indoor Club Lounge, outdoor Club Terrace with expansive views of the surrounding vineyards, a beautiful pool, Pool Cafe, and full Cocktail Bar. Tasting room hours are Wednesday through Sunday from 11-5 pm (ages 21+ only). The pool, Pool Cafe & Cocktail Bar are open 11-7 pm (all ages welcome). Bottaia is located at 35601 Rancho California Rd. Reservations can be made by calling 951-365-3388.